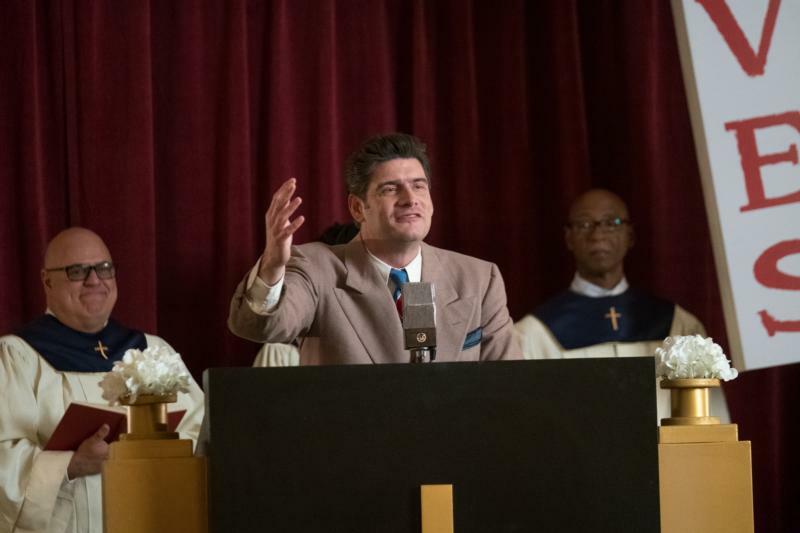 Working from the same text, director Harold Cronk continues Zamperini’s story, this time with an emphasis on the woes that beset him after he returned home at the end of the global conflict and his eventual embrace of evangelical Christianity. More artful than many faith-motivated movies, “Unbroken: Path to Redemption” (Pure Flix) sees likable Samuel Hunt taking over the role of Louie, played in the first movie by Jack O’Connell. Having survived the downing of his plane over the Pacific, a long period adrift at sea and torturous captivity by the Japanese — events related in Jolie’s picture — Louie, an Air Force bombardier, returns home, goes on the road to sell war bonds and falls for cheerful and devout Florida native Cynthia Applewhite (Merritt Patterson). But all the while he is suffering from what nowadays would be labeled post-traumatic stress disorder. Troubled by nightmares and visions in which his chief tormentor, Mutsuhiro Watanabe (David Sakurai), nicknamed “The Bird,” returns to haunt him, Louie, unable to find work, falls prey to alcoholism. His prospects worsen still further after his bid to race in the 1948 London Olympics is frustrated by a career-ending injury. Cynthia is patient and Louie’s older brother, Pete (Bobby Campo), his first running coach, tries to be helpful. But it will take no less a personage than the Rev. Billy Graham himself (played by his grandson Will) to straighten things out. Catholic viewers may have mixed feelings about the protagonist’s departure from the church in which he was raised. (Early scenes show Louie’s mother saying grace, followed by the sign of the cross, and the family is visited by their priest, though Louie, who blames God for his tribulations, receives the clergyman coldly.) Yet his rejection of Catholicism long preceded his eventual conversion. Overall, Cronk’s sequel, written by Richard Friedenberg and Ken Hixon, is both appealing in its promotion of faith and forgiveness and suitable for a wide audience. The film contains mature themes, scenes of domestic violence and a vague scatological reference. The Catholic News Service classification is A-II — adults and adolescents. The Motion Picture Association of America rating is PG-13 — parents strongly cautioned. Some material may be inappropriate for children under 13.